Black Beauty is about a horse who lived a life of adventure, making friends along the way. His great friends' names were Ginger and Merrylegs. He lived in the country and in cities such as London. This story can be sad but do not worry, it is just a story. I've read the book, both graphic novel and paperback. This movie is a great version of the book and is more suited for younger viewers. In the book there's a horse that gets hurt. In the movie they make an excellent provision for that. I love horses. They are like my life. I have a farm in Brampton. It's awesome having a farm. Anyway, back to the movie. I would recommend this movie to all ages. I rate it G.
Too sad. If you don't like sad animal movies, this is definitely not for you. I really loved this movie. I saw how a horse can really trust a human, to the point of dying. Can anyone imagine a horse like Black Beauty? I would LOVE to have a horse like him. I can't believe that he ended up in the same home at the end. I love this movie. The book was better though. That's my opinion. It was so sad when Ginger died. There's this awesome new horse club called Painted Pony Package. It cost $29.00 to join. I joined the club on 9/28/17. I love it. It's similar to PONY. If PONY hadn't closed for good in 2011 I would still be in it. For more information y'all can go to http://paintedponypackage.com . In exchange for joining Painted Pony Package I had to give up Netflix. That was OK. Netflix wasn't like I thought. Netflix is boring. i love this horse movie! I love this movie but it is so sad. I have watched better movies, but as far as bad language and stuff like that goes, it is fine. I have never been wild about English riding so that takes one star away. BEWARE: There are sad parts especially where Ginger is concerned . :'( The first time I watched it, I cried about poor Ginger. You should give it a try, though. I have found that a lot of people LOVE this movie. Read the book, so of course I had to see the movie. Cried. So. Hard. Great movie, but a wild ride... really sad stuff. But I loved it. I love this movie! I watched it when I was about to quit horse back riding because of a bad fall but after seeing this movie my whole mindset about horseback riding and horses changed! In a good way though! I continue to do horse back riding and just got over my fear of cantering! I'm so glad I saw this movie! I love this movie. I get it whenever I can at the library! This is one of the best. The music is beautiful and every time I watch it I cry. Black Beauty goes through so many people, and when he's on his last hope, he finds his old owners. I want a horse like Black Beauty! Love and have this movie. Shows how they never forget once they bond.horses and people. I love this film but got two different types: one fake and one real. obviously the real one is by anna. own the tape but reading it for a smashbook. two cool. This movie is so sad and I couldn't believe what happened to the horse, black beauty. I cried 5 times. I am reading the book right now! No crying yet! I love this movie so much! Also read the book. They are very similar! Love this movie! I love how this is telling some of the hardships horses have to face that we have never had to face. This is probably the best movie i have EVER seen. I like that it's from Black Beauty's point of view and not a person's point of view. I Love Black beauty. It shares a special bond between him and Giner. It is a very sad story, I agree. Horses are amazing and I would want to ride Black Beauty. HORSES ROCK!!!!!!!!!!!!!!!!!!!!!!!!!!!!!!!!!!!!!!!!!!!!! it is the best movie ever!!!! i would definitely recommend it! I really liked the show called "Black Beauty" It's a wonderful show! This movie is sooooooooooooooo sad. i cried like 5 times then after i got a headache. there is some scary scenes. although i only saw part of it because i just didn't have the time to watch it then....... i prefer books though so i liked the book a lot... and from what i saw of this movie it was pretty close to the book. This is the best horse movie ever!! This is such a good horse movie!! This should be the first movie you should see!! There are other great one's but this one's the best!!! OOOOOH, i love this movie. It is a sad movie. I just LOVE Merrylegs he's cute. this is a great movie even though it's touching i would reccomend it to those who havent seen it. i luv horses, i really want to own one but i go horse rididng watching horse movies makes me want to own one but, i luv watching it!!!!! u should watch it!!!! this movie is REALLY sad. Marrylegs moves away, Ginger dies, the owner has to sell him,the barn catch's on fire................their is a lot of sad things in it but the movie is really good without the sad parts so be prepared!!!!!!!!!!!!!!!!! I like this movie because it's so sweet and has a deep meaning. It's pretty sad at parts though. I watched this film and I like it. the end is very good. when I watched the end i cried. I loved this movie! It was so much like the book! I loved this book and movie because it tells the story of a young colt and stallion based on its life on a farm making new friends and growing up. i loved this movie. it was sad and made you have feelings. this is such an awesome movie! i can't believe it! if you're a horse lover you should watch this. love to the horses. This movie is sooooooo good. Its also really sad because Ginger dies. I hated seeing the not real horse with blood under the tarp. Black Beauty is an awesome and wild movie! A BIT SAD BUT REALLY GOOD!! I adored this film, and more so the book, because they portray how horses were treated by the different levels of society during the era. this movie was genius. born so happily, black beauty gets throw from the warmth of Squire Gordon and his family to the cold hard streets of little food, cruel owners, and death. i deeply recommend this heart warming movie. i cried at the end when he finally finds his beloved owner. i watched so many times i know the words by heart. "the cold hard metal bit in your mouth and over your tongue, if you've never had one in your mouth, you cant imagine what a shock it is." lol i love that part. but honestly i did cry at the end and at "good bye my sweet, good bye." sooo sad but great movie. Black Beauty is soooooooooooooooooo good!!! !Merry Legs is soooo cute!! Its sooooo sad when Ginger dies!I recomend this movie to true horse lovers! Courtsey: What an awsome movie! i've haven't seen it as much as Thurry but I loved every bit! Hi ,i am Shreya and i wanted tell you this is a VERY famous book. This is a sad but awesome movie! I truly loved this movie. Anne Sewell had an inspiration while writing this story. scene is when blackbeauty meets ginger again.That makes me cry, Later ginger died...Because of cruel humans that makes horses sufffer to death.Well it still the best story ever. i loved that movies i love to watch that movie. I love the book AND the movie!!!!!!!!!!!!!!!!!!!! This is, like, my favourite film ever!!! :) I'm so glad they had British actors, for the book is set in Britain, instead of America. How rubbish and unreal would it have been if they done an American Black Beauty? I'm from Scotland, and I say BRITAIN ROCKS, DUDE!!!! When I first saw this movie, it made cry so much that I didn't watch it for almost a year! Black Beauty is a life loving caring and sad story. black beauty was born on a wonderful farm . His mothers name was Duchess. Is mother told him"Always Lift your feet high when you trot. And always Always show respect to your owner". Once black beauty was old enough he was sold, to a nice Rancher (not sure bout name ) But i KNOW that he was nice. once he got there he made friend right away! there names were Ginger a tall stubborn Thoroughbred chestnut mare. The other one a White little pony name Merrylegs stally. My favourite film is black beuty .It is about a little boy that wakes up in the night goes to his horses stable to find it giving birth. A rich man borrows Beauty to hunt. She falls over a fence and because he had broken his leg he gets somebody to kill her the little boy was watching he was in tears. This movie is wonderful. It is moving and very thought provoking about human treatment of animals, especially horses. Black Beauty worked so hard his entire life for his owners, often with little praise or kindness in return. But it is stories like these, whether real or fictitious, that touch us and make us want to care. 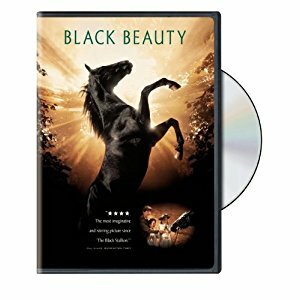 Black Beauty is beautiful movie about life through a horse's eyes, and the willingness to always try harder, no matter what the reward. black beauty has to go to so many homes that he meets new people and one night it was raining and a big storm that the bridge fell down when they tried walking over it and one of the guys fell in it was really really bad. My favorite horse movie is Black Beauty because it is really heart touching. If you have seen this movie then you know what I am talking about. When I saw this movie I about cried because of the way that they treated the horses. The way that they treat the horses in this movie will properly make you cry. When the movie starts it seems nice. The horses are in as nice place, but when it gets to the middle it gets really sad and upsetting. So if you decide to watch this movie I would suggest having a box of tissues beside you. Black Beauty is a wonderful movie and heart breaking. Some parts of it will wont to make you cry. I love this movie and it will touch your heart. I have never seen a movie so touching that makes you want to go into the movie and take the horse out of there. I bet that you will love it. Black Beauty is such a sad story, but it's good, because it teaches people to treat animals right and not abuse them. I like this movie because it tells about a unique horse that finds its way on one of the most amazing adventures every heard about a horse. I once watched the movie and fell in love with it but it does stink (what happens) to his love. But then he redeems himself when he meets Peter (I think or David or something like that) again.